Prickly Poppy - Argemone munita is considered a short lived perennial or an Annual. This plant is herbaceous (green stems versus woody stems). The plant sprouts from seed and when it takes hold in the soil it can grow quite aggressively. This plant had me fooled when I photographed it - one look at its inflorescence and I thought I was looking at Matilija Poppy. While the flowers are definitely similar, the spiny foliage of the prickly poppy should be a dead giveaway to tell these two apart. The other clue is that the Matilija Poppy grows a lot taller than this plant - up to 15 feet versus five feet. 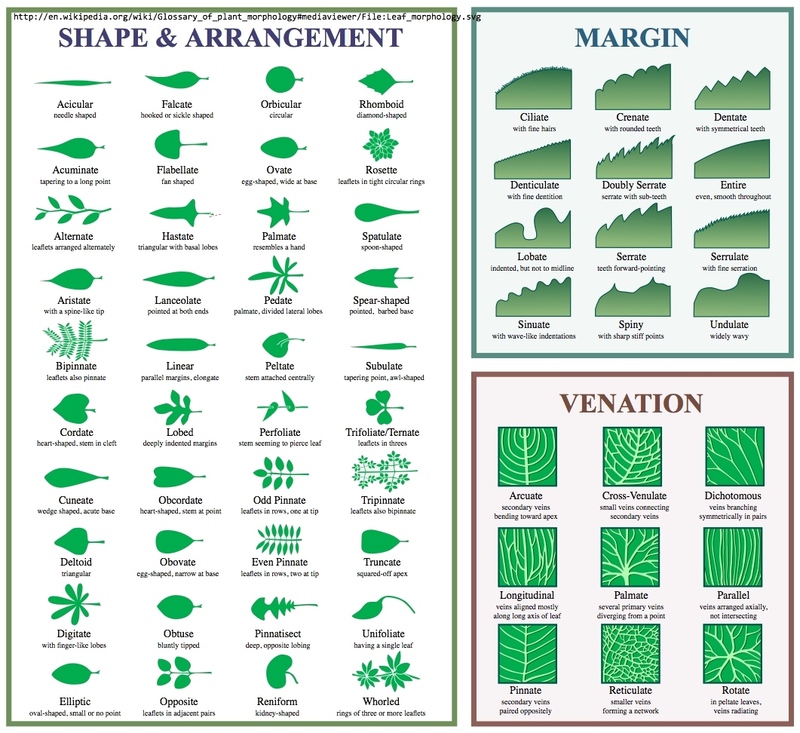 The plant has blue green leaves and stems, with spines throughout - leaves, fruits and stems! 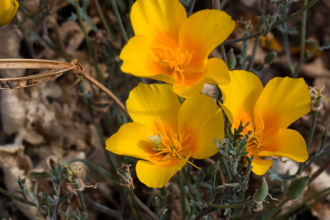 Prickly Poppy favors an especially dry habitat of sandy or gravelly soil. 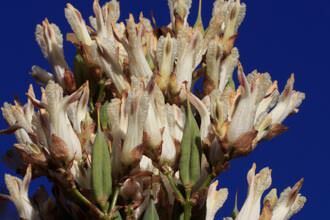 It commonly blooms from April through August in this area and can be a fire follower. 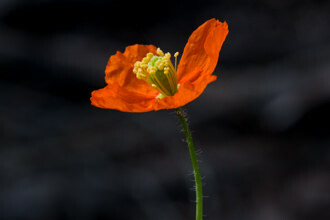 I saw a number of these plants in Cheseboro Canyon in April 2007, a year and a half after fire swept through the area. Prickly poppy has flowers with 4 or 6 white crinkly petals, three green sepals, yellow centers and dark colored pistil. 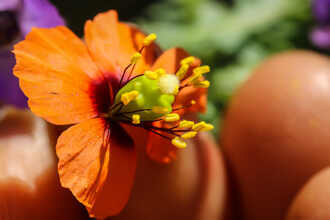 Surrounding the pistil are a couple of hundred yellow to orange stamens. The flowers are a bit smaller than the Matilija Poppy - 130mm versus 200mm. The seed capsule is 1 to 2 inches long. 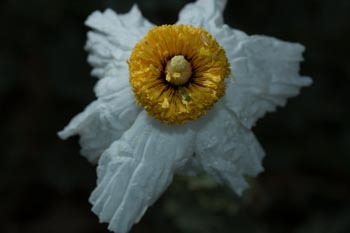 Flowers do appear similar to Matilija Poppies with slight differences. 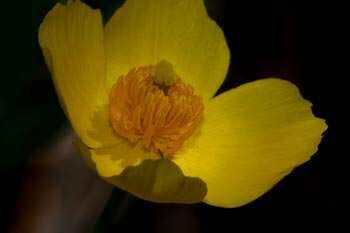 The Pistil is dark on Prickly Poppy versus yellow on the Matilija Poppy. Flowers from both species viewed sided by side would show why the Matilija Poppy has the largest flowers in this plant family. Strikingly, the flowers from both plants look like fried eggs served sunny side up. This plant is very poisonous. Notwithstanding this, like other poisonous plants, its lore includes medicinal uses. Argemone means "cataract of the eye", and this hints at one of those uses. munita suggests "armed as in munitions". Last modified: June 15 2017 10:52:29.